Monday – I discovered I have a black toe nail, presumably a leftover from my half marathon a few weeks back. Yes, I do look at my feet regularly and I wash and moisturise them too but my pinkies seem to hide away under the little piggys “who had none” so I hadn’t noticed. (I do also cut my toe nails in case you were wondering but I had done them just prior to the half.) So now I have a real runner’s badge of honour. Friday – saw my first drug deal. This is the non running related first!!! Although running could have come in handy if they had turned nasty. And no, I wasn’t buying (or selling). I just happened to be casually sitting in my car in a Harvester car park with my mum when we observed the deals going on. I’m thinking of asking to go into a witness protection programme! Saturday – after 29 parkruns, my 30th took place in the rain – the first ever despite running through the winter. I must have a happy weather genie on my shoulder on a Saturday morning. And even then it wasn’t heavy persistent rain, just a steady drizzle which had more or less petered out by the time I’d finished. But at least I didn’t get up, see the horrible weather and go back to bed again. They say psychology has a lot to do with your running success ….or failure. I think in my case this definitely has some merit, for instance, looking back at my inability to complete a 10k run without involving any walking. Hopefully that issue has now been resolved since I managed to complete my last two 10k events without walking. I am (quietly) confident my next 10k event, the BUPA London 10000, in 6 weeks time will pass off without incident – fingers crossed it’ll be fourth time lucky on this particular course. But although I seem to go to each organised run thinking “I’m not going to walk this time”, almost predictably I end up walking. It’s like I subconsciously can’t wait to fail! Do I relish the thought of regaling people with how “it went fine until ….”? Am I seeking sympathy? Anyway, by the end of our conversation, I had agreed to set myself only one goal for my next half marathon. To get a PB. Now that in itself is a tall order but perhaps if I can concentrate on that one goal, I might put less pressure on myself – I might then even succeed in achieving the other two! See, I’m doing it again!! 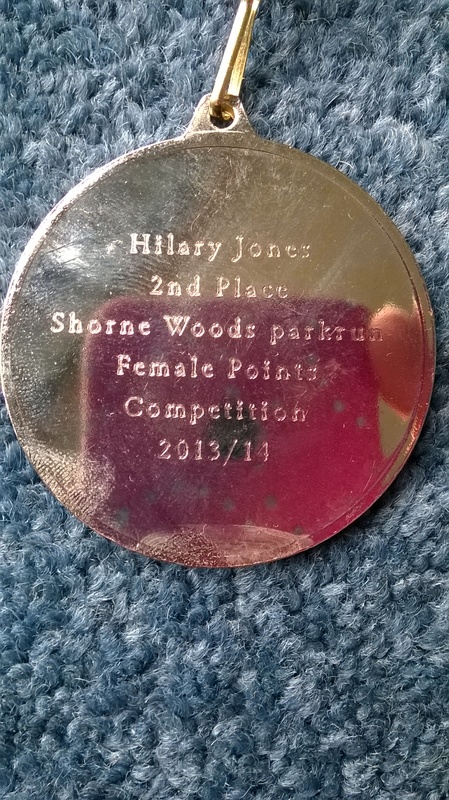 Turning now to parkrun, the week before last Shorne Woods returned to using Course A. This route has not been used since last November thanks to the mud fest on the back of the course. Course A involves two 2k laps followed by a 1k lap. Course B involves three equal laps. But both courses measure 5k. So our first 2014 outing on Course A produced what? My second best ever parkrun time, missing my PB by 8 seconds (and yes that too was achieved on Course A). This weekend I got a new PB and believe me I am very happy about that but why do I run faster on Course A than on Course B? It’s exactly the same distance and therefore level of difficulty! Purely psychological? It must be all in my head! So just two examples of how my brain influences my running! I’m now off to find a book on positive thinking! Thirteen months ago I noticed my Twitter feed on a Saturday was littered with references to parkrun. When I researched further I thought it sounded good but it appeared the closest parkrun was Bexley which seemed a bit far for regular attendance. Oh well, I thought and forgot all about it until the start of the summer when I came across a couple more references to parkrun in magazines. 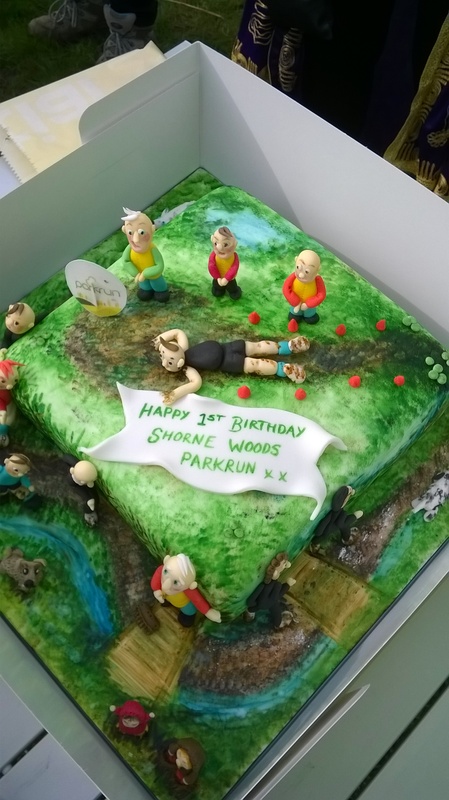 I went back to the website only to find there was now an event at Shorne Woods – only two miles down the road, excellent. It then took another month for me to pluck up the courage to attend my first run and the rest, as they say, is history. I can honestly say that the only weekends I’ve missed have been down to other commitments, nothing to do with not wanting to get out of bed on a Saturday morning. Although credit where it’s due, Chase the Place and Jantastic have been huge motivational forces. I’ll admit there have been weeks when I’ve gone with the attitude that it’ll just be a “recovery” jog, I’ll take my time, just get around but then something seems to take over and it’s often these weekends when I do my better runs. Is it the presence of other runners dragging me around with them in a runners’ vortex, often supporting with constructive comments or just pure encouragement? Whatever, something works! Perhaps even more surprising has been the reaction from acquaintances be it friends, family or clients. Since August I have managed to put off any work commitments until after I’ve had time to do parkrun but recently I was asked the dreaded question, could I meet a potential new client at 9am on a Saturday!!! Oh no, the time had finally come and my head eventually overruled my heart. I said yes. Now my head may have been sensible but what amazed me more were other people’s reactions. All those I mentioned it to said I should either say no, I wasn’t available; put her off until later in the day or bring her along (give me time!). Obviously the way I have been raving about how great parkrun is must have been sinking into other’s psyches! So far I’ve only managed to get one other runner to come along but I shall keep persevering. I often see other runners out and about when I’m en route to Shorne and I want to stop and say “come with me”. Perhaps I should resort to kidnap! 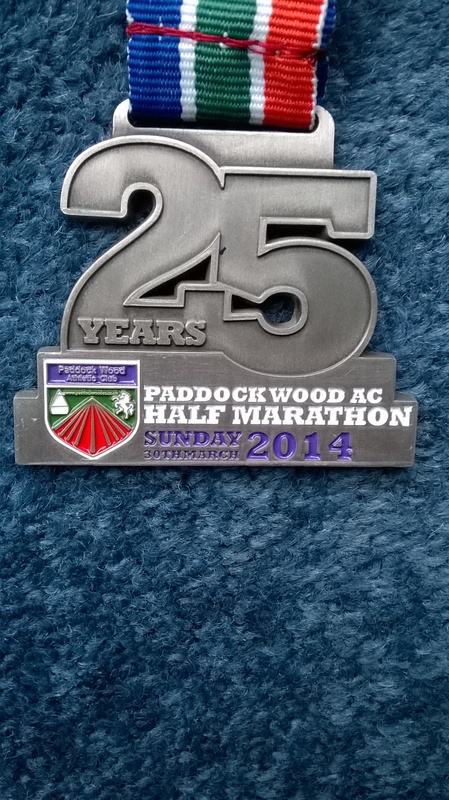 So the dust has settled and I’ve had time to reflect on Sunday’s Paddock Wood half marathon. If somebody had told me on Saturday what my time was going to be and how the run was going to evolve, I’d have wondered why I was bothering to turn up. Today I’m more philosophical about it. And to be honest I wasn’t even that disappointed Sunday afternoon. I knew what had gone wrong – my continuing struggle with learning to pace myself. “Pacing is a science: start off too fast and you’ll burn glycogen at a higher rate than your body can handle, leaving you struggling for energy at the stage where you need it most” – how true! It then continued “Start off too slow and that target time will just keep disappearing away as the race progresses.” Yes, but I think that’s what I need to do, start off a little slower! Back to Sunday. I won’t bore you with too much detail, suffice it to say, the first few miles seemed to me to be run at a relatively relaxed pace. No need to try and dash past other runners; there was plenty of space and even the “hill of note” at 1.25 miles didn’t prove too much of a problem. However, my Garmin was giving me warning signs which I chose to ignore. First mile, just under 9 minutes, and the following two miles a bit quicker. By the time I got to six miles, there was a point where this fleeting thought flashed across my mind. If this carries on I could get a PB and even get in a sub 2 hours. My mind imagined the glory of telling everyone my achievements even though I have been here many times before! I seriously thought my regular running with parkrun had got me out of the bad habit of going off too fast. I also thought running with other people had calmed me down. I thought wrong! So I didn’t achieve either of my goals on Sunday – to run a half marathon with no walking and to beat my previous Paddock Wood time. But on a positive note, if I can repeat the first half of Sunday’s performance at my next three runs (BUPA London 10000, City of London Mile and the Anniversary Run – 5 miles) I shall be a very happy bunny. And then perhaps I can aim to do better at the Royal Parks Half in October. I can but live in hope!